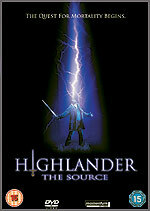 Momentum will be rebooting the Highlander franchise with the release of Brett Leonard's Highlander: The Source on DVD on January the 7th. The film features three stars of the long-running Highlander TV series - Adrian Paul (Duncan Macleod), Jim Byrnes (Joe Dawson) and Peter Wingfield (Adam Pierson) - and finds the immortals searching for their equivalent of the Holy Grail, the mysterious Source. No technical details were announced, and there was no mention of any bonus features. The RRP is £15.99. To read the full press release see the disc's Incoming entry. Full details of Tartan's much-delayed DVD and Blu-ray editions of The Seventh Sign, including details of the bonus features, have been added to their Incoming records: DVD Blu-ray. Tartan's The Phantom Carriage DVD has been delayed until February the 25th. MGM Home Entertainment and Twentieth Century Fox Home Entertainment will release a box set of all twenty official James Bond movies, housed in an acrylic box, on November the 12th. 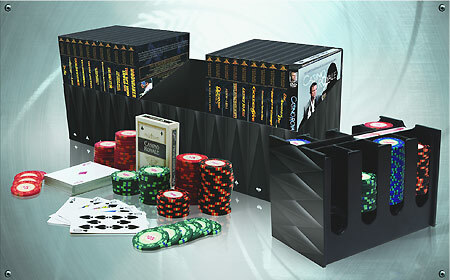 The set contains forty-two discs, including a two-disc edition of Casino Royale, along with two packs of Casino Royale branded playing cards, and a complete set of poker chips from Carta Mundi, as seen in the movie. MP3 clips from three forthcoming Doctor Who audiobooks are available. Two are from unabridged readings of two classic Target novels: Terrance Dicks' Doctor Who And The Giant Robot (read by Tom Baker) and Malcolm Hulke's Doctor Who and the Dinosaur Invasion (read by Martin Jarvis, who played Butler in the 1974 story). Both titles are released as four-disc sets on November the 5th. The third clip is from the narrated TV soundtrack of the Jon Pertwee adventure The Curse of Peladon, which features Katy Manning.